In your lifetime, you get only one true mom. Some are biological and some are not, but your mom will always be your mom. Amber Norman, daughter of Kimberly Ann (Carrillo) and Fred Terry's sat down to talk about her mom and what a great mom and nana she was. 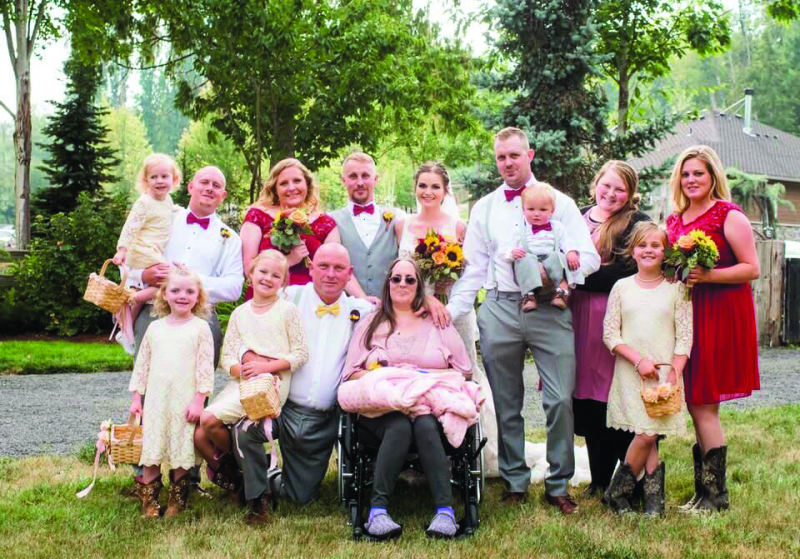 Kimberly lost her battle to cancer on September 12, 2018 surrounded by family with her husband holding her hand. Kim and Fred Terry have been together since 1987, they raised their children in Winlock. When they first moved to Winlock "Mom worked at the school in special education, she was a paraeducator, Mom coached youth cheerleading for years for me and my sister while Dad coached youth football, always together and always on the same field," stated Amber. "She devoted her life to being a mom, baking cookies, afternoon snacks when we get off the bus, she was our everything and we were her life. As we grew up, we had children of our own and she became nana, not grandma but nana," continued Amber. "Mom watched all five grandchildren while we worked. Dad always said, she doesn't just watch them she teaches them like in school. Because of Mom teaching our children, they were all advanced when they started school. She loved ABCMouse.com and each of the kids had an account when they were old enough," stated Amber. "Mom and Dad built a little playground for the grandkids, her grands were her everything as well. She raised kids her entire life, she was the proudest nana you could ever meet. She never drove a car but she accomplished more than many who did drive," continued Amber. "Mom was diagnosed on July 27 with uterine cancer that had spread to both her lungs, bones and lymph nodes. By the time they figured it out, she was full of cancer. Mom went to Centralia Hospital for 13 days and then Dad insisted she go to Swedish Hospital in Seattle for radiation so she could make it to my brothers wedding. She got out of the hospital the day before his wedding which was on the 24th of August. She stayed with Grammie because my Dad wanted my Grammie to have her part in taking care of her only daughter," she continued. "My Dad was with my mom during every step of the way," Amber said. "It was an amazing thing to watch. He was her advocate. It was a side of my dad I hadn't seen before. He loved her with his heart and soul. Dad was still trying to help to the end to get her well, he went above and beyond. Mom passed away peacefully at home." She is survived by her parents, Ann L (Roberts) and Albert "Lynn" Withey of Napavine and Lewis L. Carrillo Jr. of Santa Rosa, California; her husband of 31 years, Fred J Terry; children Michael (Kellie) Carillo of Onalaska, Amber Normal of Winlock, Justin (Holly) Terry of Winlock and Brandy (Kris Smith) Terry of Winlock; five grandchildren, Kaylie, Kelsie, Lilianna, Melodee and Tucker; brothers Robert E. Withey of Hillsboro, Oregon; Brandon L Withey of New Orleans, LA and numerous nieces and nephews. She also had her beloved dog Tink. There will be a fundraiser this weekend at the Olequa Senior Center sponsored by Small Acts of Kindness to help with the expenses. It opens at 1:00 p.m. for food and a silent auction, 6:00 p.m. dessert auction and 7:00 p.m. to 10:00 p.m. there will be a comedy show along with a beer garden.